Need a mitre saw and a table saw? Have both in one! 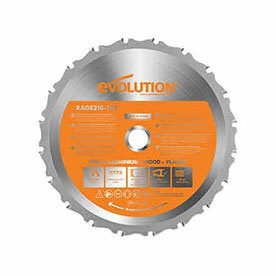 The R210MTS is the perfect solution for cutting wood based sheet material in Table Mode, and perform accurate, compound cutting in wood, aluminium, mild steel and more in Mitre Mode. Accurate cutting in both Table Mode and Mitre Mode. 0° - 45° bevel tilt and 47° - 47° mitre covers all common, compound cutting angles. Positive mitre stops every 5 degrees. 32mm Max. depth of cut in table mode. 55mm x 115mm Max. Cross cut in mitre mode.